What happens when two high school teachers get fed up with their soaring grocery bills and decide to try to feed themselves on one dollar each, per day? 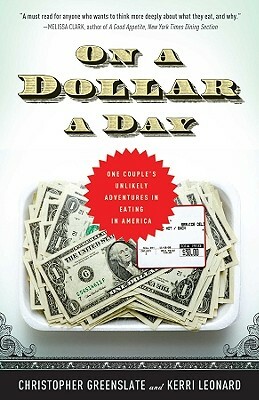 Authors Kerri Leonard and Christopher Greenslate describe how they did it--and also include sections about eating on a little more than $4 a day, as well as on the actual costs of eating a healthy diet. On a Dollar a Day also includes fascinating facts about the way our food gets to the table and the hidden costs--both personal and financial--along the way: How food companies "short size" packages so that you pay more for less food? Why one tablespoon of salad dressing costs as much as a whole orange? How grocery stores auction off foods past their "sell by" dates? Why processed foods have a higher markup than fresh foods? Why it takes so long for food prices to drop, even after fuel and shipping costs go down? How 36 million Americans have limited food options, even during a national obesity epidemic? Christopher Greenslate teaches English, Social Justice, and Journalism to high school students in San Diego. He founded the Social Justice program in the school district as a forum for students to discuss important issues of the day. The dollar-a-day project grew out of his desire to show his students how to get people to see an issue with a new perspective. He was the 2008 Reynolds Institute Fellow of the American Society of Newspaper Editors. He has led workshops at large events such as the annual Teachers for Social Justice conference and the National High School Journalism Convention. Christopher was selected by Rotary International to travel to East Africa as part of a group exchange in 2009. Kerri Leonard grew up in Northern California in a family of grocers and worked at a grocery store for six and a half years. Kerri teaches English and Speech and Debate in San Diego County. She was named Speech and Debate Coach of the Year in San Diego. Christopher and Kerri live in Encinitas, California.